Sometimes I find myself needing to eat something other than cereal, fruit or eggs for breakfast. Does anyone else feel like that? Usually if I get up early enough I’ll scavenge our kitchen for things that I can toss into a batch of muffins. Since we had a single spotted banana I decided to mash it up and make this “half batch” of muffins. It only yields 6 muffins, but honestly that’s the perfect amount for a small little family like ours. 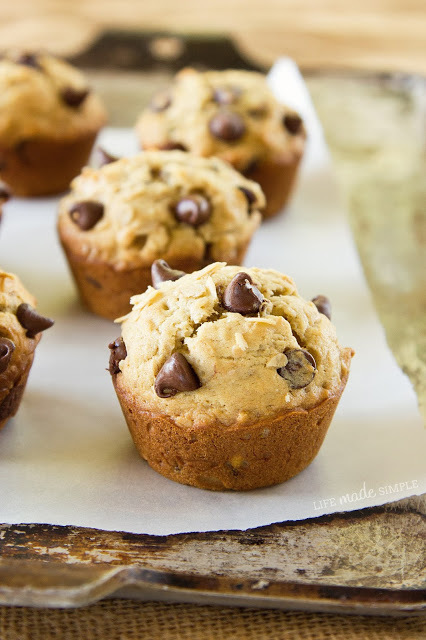 Instead of doing a plain muffin, I tossed in a few chocolate chips and some old-fashioned rolled oats. The muffins smelled wonderful and tasted delicious too! It was kind of like eating a healthy oatmeal chocolate chip cookie 🙂 Next time I might try tossing in some strawberry chunks or even swirl in some peanut butter… the options seem endless! 1. Preheat oven to 350 degrees. Lightly spray or line six wells of a standard size muffin pan, set aside. 2. In the bowl of a stand mixer, beat together melted butter and sugar. Add sour cream (or buttermilk) and mashed bananas, mix on low for 30 seconds. Add egg and vanilla, mix until just combined. 3. In a small mixing bowl, combine flour, oats, baking soda, and salt. Whisk together then with mixing speed on low, gradually add dry ingredients. Mix until just combined. Remove bowl from stand and fold in chocolate chips. Using a large scoop, fill each well ¾ of the way full (or a little more if you have some extra). 4. Place in oven and bake for 18-22 minutes. The tops should be lightly golden brown and they should be nice and firm. Remove from oven and allow to cool in pans for 2-3 minutes before removing and transferring to a wire rack to cool completely. I love muffins for breakfast! 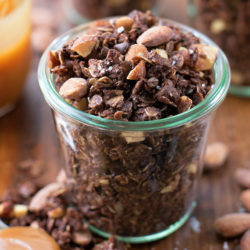 Can’t go wrong tossing in oats and chocolate! These are yummy – and quick to put together! We like the texture that the oats add to the muffin! A regular for our Friday Muffin rotation – try them! Love these and so does my daughter (She’s a year and a half)! We have them for breakfast some days so I boost them with a little chi seeds as well as replacing some of the flour with flax seed and extra oats!! Can I make it with just regular milk?? If you’re going to use regular milk, add a touch of lemon juice or vinegar to it 🙂 OR try using yogurt! What a yummy recipe! I made a quadruple batch because I like to freeze muffins to pack in my kids’ lunches (I ended up with 35 nice sized muffins!). Anyway, because I was making this x 4, I used 3 cups regular flour and 1 cup oat flour, and I used melted coconut oil in place of the butter. Oh, and I used buttermilk made from milk and apple cider vinegar. I also added a pinch of cinnamon….because I have a compulsion to add it to almost every baked good I make!!! 🙂 Oh, and I baked them at 375 for 20 minutes because I know from experience that if you want a nice, domed muffin top, you need the heat to be higher. Also, my oven isn’t working 100% properly, so I made this adjustment to make sure they came out perfect! 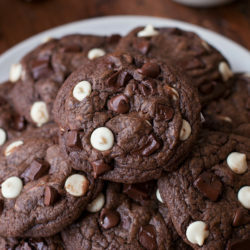 Made these tonight, with white whole wheat flour (King Arthur) , and subbed the buttermilk with plain Greek yogurt, n they turned out perfectly in my oven at 18 minutes! Glad to hear they came out perfect! Thanks for sharing Jeni! Do you think substituting the butter for avocado oil would turn out all right? My sister has made your recipe for years and they are the best muffins! 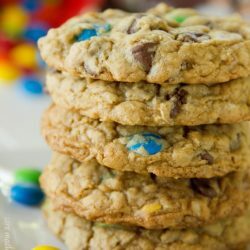 I have a toddler now and want to try to make these with the best substitue for flour, what do you think would be best???? Almond flour??? Thanks! Hi Stephanie! Is your toddler gluten intolerant? If so, I’d suggest a cup for cup gluten-free flour, if not, I’d suggest using the same amount of white whole wheat flour and adding an extra tablespoon of buttermilk or sour cream to the recipe. Hope that helps!